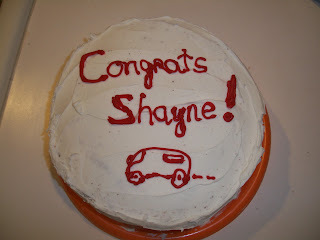 but I am especially thankful that my first car ride with Shayne (him driving, not me) was really non-eventful. He got his learner's permit today- and to celebrate I promised to let him take me for a ride tonight. Since the day he was born, I have believed in kind of jumping in with both feet. I sat him right next to the phone and turned on the vacuum cleaner the first day he lived in our home- so he would get used to the noise. It worked, he would sleep through anything.... if he wanted to sleep at all. Mud, Dirt, Guns... no problem. So, with my twisted take on parenting, where else would I let him drive me the first time ever? He surprised me how well he did; I apparently surprised him how well I did. I figured if I faced some of my hardest fears right off the bat- then the next 9 months of "learning" will be a piece of cake. I sure am thankful for my Shayne!!!!! I am not pleased at how fast our boy is growing into a man. Not cool. Not cool at all. I'm so glad you had a lovely first adventure together :) Give him a hug for me!